The other night I finally finished my work for the day and pushed away from the computer. Feeling the tightness in my chest and noticing how my shoulders were rolled forward, I laid down on the hardwood floor and focused on breathing, stretching, and massaging muscles until my shoulder blades once more laid flat on my back. The obvious source of the discomfort was in my chest and shoulders, but as I followed lines of tension I found myself working on muscles in my forearm, which, as they relaxed, helped my shoulders to relax and open. What is the process here? How does a forearm muscles help tighten or relax the shoulder? It might seem strange since the muscles I was working on, the Flexor Digitorum, do not directly attach to the shoulder, or even the upper arm. 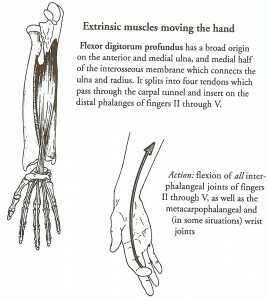 Flexor Digitorum: Notice how the muscle is shown attaching from the fingers to the ulna and radius. The fascial structures are not shown. Taken from "Anatomy of Movement" by Blandine Calais-Germain. 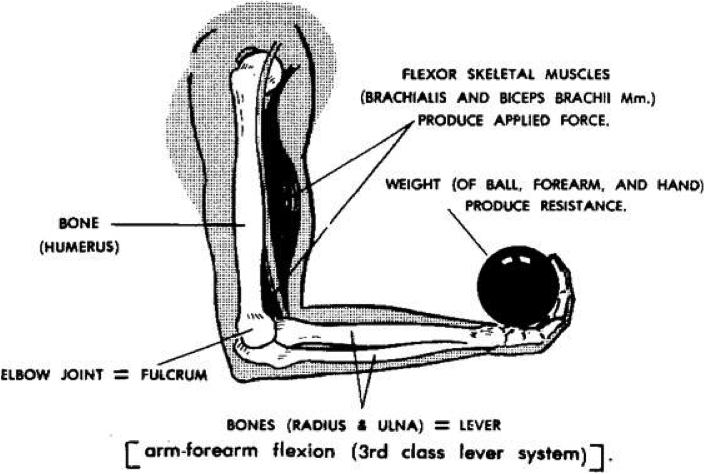 A common over-simplification of the classical biomechanical model is that muscles attach directly to bones and that, as a result, one can calculate the force that a muscle is contracting with and assume that this force is applied to the bone which causes the bone to rotate around the fulcrum point of the joint that the muscle crosses. The problem with this view is that muscle does not attach directly to the bone, rather it directly interacts with the fascia – often called the connective tissue, which includes tendons and ligaments. 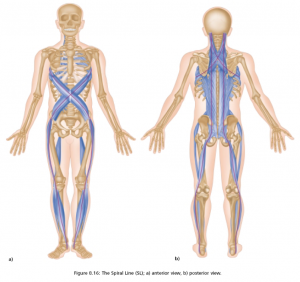 Yet, as the traditional name “connective tissue” implies, the fascia is often oversimplified and treated as a simple connector between the muscle and the bone, much like a cable that directly transmits the force of the muscle to the bone. 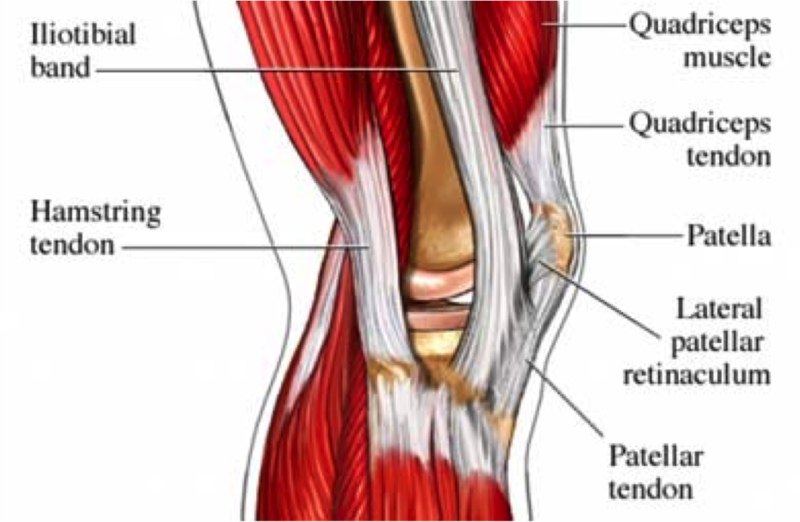 Here is a fairly traditional anatomical drawing of the knee that depicts this over simplified role of tendons and ligaments. Classic anatomical drawing. Notice how the tendons directly connect a muscle to a bone. Compare that with this next anatomical drawing, which shows more details of how the fibers of the fascia interact. In this drawing, it is harder to say what the final effect of a muscle contraction will be. 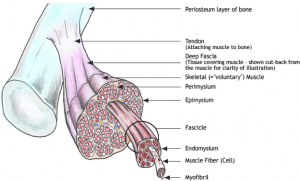 The muscle will pull on the fascia, but the fibers of the fascia interact with each other in a complex mesh and seem to attach to many locations. This is complicated by our bodies process of laying down collagen tissue which will “glue” neighboring muscles and ligaments together if they are not moved frequently enough (see My post on Fascia, Collagen, Motion, and Bodywork). To see the complexity, look at the fibers labeled “iliotibial band.” If you pulled on the top of this, what would happen? It splits into multiple branches attaching to various other structures that are also themselves affected by various other muscles. 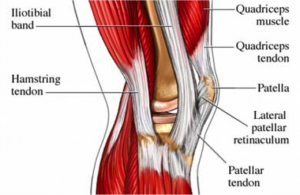 Pay attention to how most of the fascia in the knee connect to the patella (the knee cap). 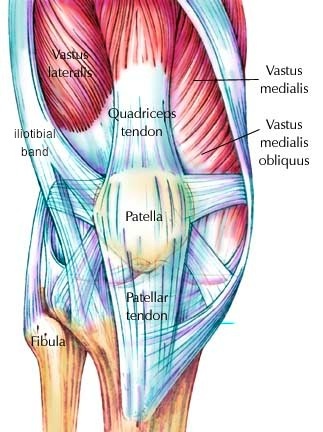 The patella is not anchored in place, rather it is “floating” in a web of tension from all the fascia connections, thus all muscles that connect to the patella directly impact the tension and flow of forces from all the other muscles and fascia which connect to the patella — i.e. it all connects! Now, let us take this one level further and look at the following picture of the knee of a human cadaver. The Body Worlds Exhibit where I first saw this is an AMAZING experience and opened my mind to a lot of understanding by being able to see the full structure of the body in 3D. What you see here are broad sheets of connective tissue to which the muscles attach. Looked at this way, it becomes clear that the exact impact of a muscle contraction will be distributed over a larger complex system of interacting forces. With this in mind, let us look more closely at what fascia is. Fascia is the fibrous material that gives the ultimate structure of our bodies. Every muscle is surrounded by fascia, and the outer layer of the bones, called the periosteum, is also fascia. 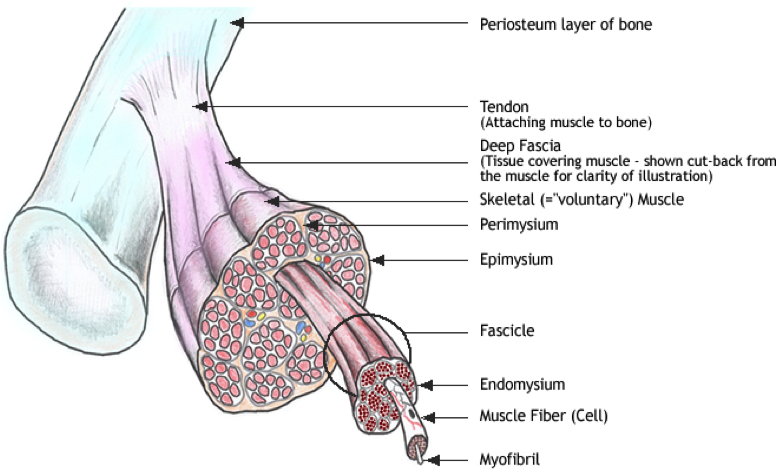 In fact, the fibers that surround the muscle are continuous through the tendon to the periosteum, as illustrated below. Putting aside the image of tendons and ligaments as simple “connective tissue” between the muscles and bones, a better visualization is a continuous web of fascia, within which the muscles and bones are suspended. This is made obvious by looking at how we develop. During the early stages of embryonic development the body is a network of fascia with approximately 660 pockets within which the muscles and bones will grow. Returning to the question of how tightness in the forearm can affect the shoulder, we can now follow the flow of forces generated by a muscle. When a muscle contracts or is locked in a shortened position, it pulls towards the middle. The muscle’s pull doesn’t fully ground out into the bone to which it “attaches,” rather the force is transmitted into the fascial structures that it is part of. 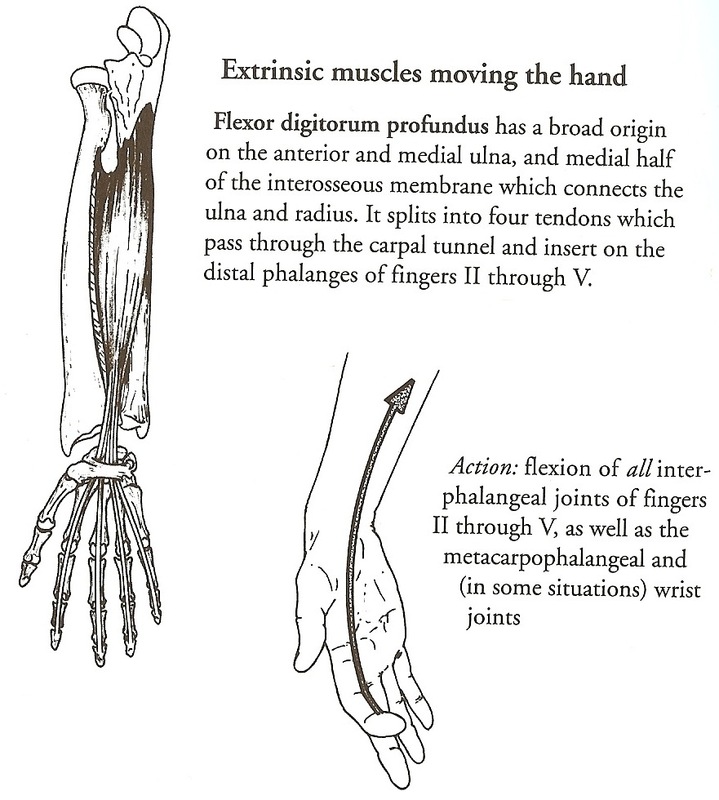 The force is then distributed further, some of it going into the bone, and much of it pulling on muscles on the other side of the joint which are part of the same fascial structure. Thus, a tight muscle in one part of your body can pull a joint further away out of alignment by transmitting force through the bodies fascial structures. There are many folks who have studied the patterns of how force transmits through the body. One of the most influential writers on this topic is Tom Myers, who wrote the book Anatomy Trains: Myofascial Meridians for Manual and Movement Therapists , where he traces out long meridians of how force transmission through the fascial structure. 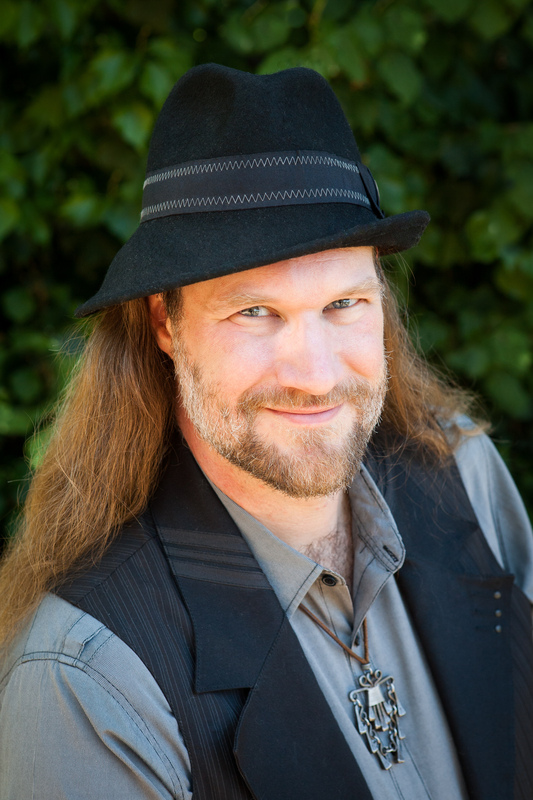 For those interested, I can strongly recommend reading further on his website. The Brain is for Motion! UPDATE Oct 2012 To see some of my recent work on applying fascia centric concepts to tensegrity robotics, see my post on a robotic tensegrity snake, development of a tensegrity based planetary lander, and a video of a lecture I gave in Switzerland. Further information on the human body can be found in the Bodies category of posts. Tagged with biotensegrity, Bones, fascia, healing, Muscle, pain. Very interesting in relation to fibromyalgia and tender spots – I can see now that they correspond to points on the force meridians. Food for thought. Thanks! Nicely written. Many physical problems from working at a computer and be helped by using an Adjustable Height Desk I have used one for years and love it. All my connective tissue is being agonisingly destroyed and I think the fascitis and fasciosis is the hardest to bear. In my case, as in many, it was caused by a few tablets of a (fluoro)quinolone antibiotic. It’s a deeply grieving to be a healthy person, whose body worked so beautifully, and to be rotting slowly just to give profits to the pharmatrade. This is cool. Thank you for a for a clear resource that isn’t based on fluffy thought. Some perspectives on fascia and massage are pretty out there.